Until now, the emerging field of edge analytics has been focused on the internet of things and being able to process data at the point it’s created by a sensor. Now, thanks to the ability to separate fluids at a micro level on a chip just 22mm by 15mm, a new form of edge analytics could help reduce downtime and maintenance costs on oilfield equipment. A university spin-out company, RAB-Microfluidics is using the field of microfluidics to create a “laboratory on a chip,” as they call it. Microfluidics is a technique by which fluids can be separated into their constituent parts by how they flow through typically sub-millimeter channels edged into glass microchips. By harnessing this technique, oil samples from heavy machinery, such as compressors, pumps, generators or engines, can be analysed on site, instead of having to be shipped to onshore laboratories for analysis. By analysing oil samples, operators are able to see how well the machinery is performing, if there’s any degradation or contaminants, which helps to indicate when maintenance is required, preventing unwanted machinery failures. RAB-Microfluidics, which was given a boost in 2018 by completing a technology accelerator programme run by The Oil & Gas Technology Centre (OGTC) in Aberdeen, TechX Pioneers, is targeting the offshore upstream oil and gas industry, where machinery is operating in remote locations. Being able to do analysis on site – real-time – reduces logistics costs and means the operators know right away how their machines are performing, instead of having to wait what can take multiple weeks, says company founder and managing director Rotimi Alabi. RAB-Microfluidic’s 22mm by 15mm lab on a chip is a heat cell with microchannels which separate the oil out so that spectroscopy can be carried out on it using a 30cm by 20cm portable laboratory that the firm has also developed and called the Microfluidic ATOM. Alabi developed the idea for the technology while working on a PhD focusing on oil analysis at the University of Aberdeen. His work initially focused on detecting asphaltenes in produced oil, which would help oil firms prevent blockages in their pipelines. But, he found that there was a greater need for analysing oil used in machinery, initially in the maritime and offshore wind sectors. The company has been working with Maersk, in shipping, and Siemens Gamesa and the Offshore Renewable Energy Catapult, in offshore wind, on how they could use RAB-Microfluidics technology. Being based in Aberdeen, the oil industry was also an obvious market, but it’s seen as having a high barrier to entry for new technology. 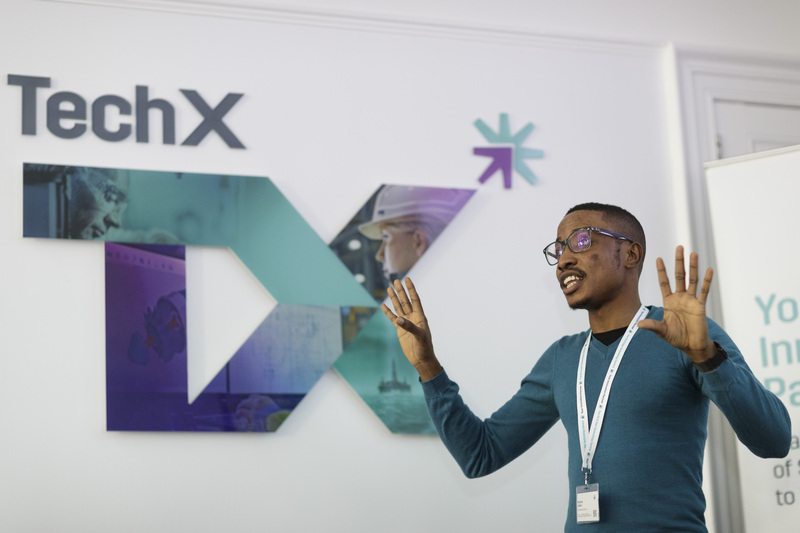 Despite this, Alabi, who founded RAB-Microfluidics in 2016, was encouraged to try and in 2018 the company was accepted on to the OGTC’s TechX programme. Just 10 companies were excepted on the first TechX programme, which has given RAB-Microfluidics access to funding, but also mentors and oil and gas companies. Alabi says the technology is now at technology readiness level five, meaning it has been laboratory tested. The next step is to test it in a real-world environment. Alabi says RAB-Microfluidics is already in talks with a number of companies who are willing to pilot test the product, across the wind, maritime and oil and gas industries. Applications for this year’s TechX Pioneer programme are open until January 31, 2019. Following applications closing, a select group will take part in a finalist bootcamp in February. The successful applicants who make it through the bootcamp will then be offered a place on the Pioneer programme which will begin in May and run for 16 weeks.